William started playing the violin at the age of 8 through his local music service in Solihull. He then went on to join Birmingham’s Junior Conservatoire at the age of 16 and following two years spent there, he studied at the Royal Northern College of Music, graduating with a first class honours degree in 2017. He is now in his final year of post graduate study at the college where he learns with violinist and teacher Pavel Fischer. As a keen chamber musician, William has won college prizes including the Hirsch and the Weil prize with his string quartet, who are increasingly performing recitals in the UK. He has also appeared as finalist in the RNCM’s Schubert and Christopher Rowland Prizes. As an enthusiastic orchestral player, William has led the RNCM Symphony, Chamber, Opera, Concert and Brand New Orchestras, as well as leading in the college’s annual tour to Montepulciano. He has performed with professional orchestras including the Manchester Camerata, BBC Philharmonic, Royal Liverpool Philharmonic, Northern and Welsh Chamber orchestras. During 2017, William was awarded the Waddell Prize for string players, performed as a soloist with the Manchester Universities String Society Orchestra and in several recitals in the UK as a duo with piano. 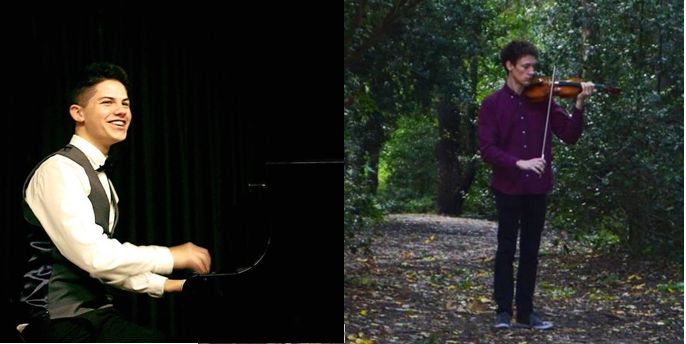 21 year old, British pianist, Sean Greenheld from York, currently studies in his fourth year at the Royal Northern College of Music under tutor Helen Krizos. Sean began playing at the age of 7 and later went on to audition and accept a place at the Yorkshire Young Musicians studying with renowned tutors Svetlana Pinegina and Benjamin Powell. He has enjoyed a wealth of experience performing in venues across the United Kingdom. Particularly the Purcell Room in London, The Howard Assembly Room in Leeds, The Millennium Centre in Cardiff and in the Dewsbury Minster. Sean has had the fortune of undertaking several masterclasses with distinguished pianists such as Martin Roscoe, Carole Presland and Alessandro Taverna. A key focus for Sean is his love and passion for chamber music, believing that music is most powerful when shared. He relishes in the opportunity to collaborate with others and is keen to pursue chamber music as a key part of a varied musical career.